Bauhaus. The Industrial Revolution. The safety razor. Minimalism. Form follows function. The Minox subminiature camera, typography, the cell phone, and much much more are covered as design milestones in Design: The Whole Story, an astounding compendium of the roots of modern design, its influences and uses that covers over three centuries of noteworthy achievements. While “design” may be thought of as amorphous, it touches on every aspect of our lives from the most exalted bridges and quarter-million dollar cars to the most prosaic vacuum cleaners and wallpaper. Edited by Elizabeth Wilhide and contributed to by an impressive group of archivists, researchers, writers, illustrators, and photographers, Design: The Whole Story is an amazingly comprehensive and inspiring book. The book is lavishly illustrated and enticingly informative as to the specific topics it covers. Beginning with design in the 1700s, the Industrial Revolution, and the impact of Thomas Edison's stimulating the demand for domestic electricity, it traces how industrialization and mass production were influenced by two chief influences of the latter 19th century, Japonaiserie and Art Nouveau, that eventually impacted the architectural design of Antoni Gaudí’s Casa Batlló in Barcelona, New York City’s Chrysler Building, and even the new Fiat 500. In one sense the book is too broad in its coverage, such as cleverly tackling the subject of “good taste” within the framework of 18th century decorum as an offshoot of “trade expansion and the Industrial Revolution [that] generated the increase in consumption . . . [and] the number of designers producing goods.” But one cannot help but be impressed with the thoroughness or research with which the wide-ranging subjects are covered in its 575 pages. Topics such as military innovations or industrial design as related to household objects, vehicles, furniture design, the development of plastics, textiles, architecture—are all eventually connected to how it all affects our quality of life. 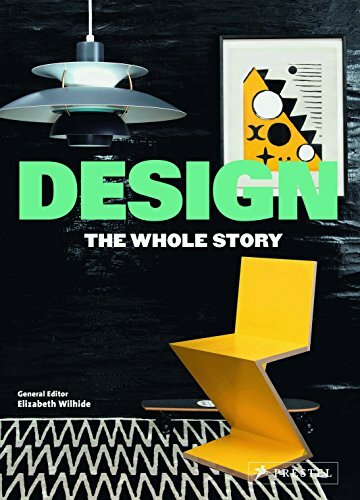 From Legos and Tupperware to the Eames Chair, Design: The Whole Story is an engaging compendium, a fascinating read, and a valuable resource for the curious minded.